I’ve been away visiting family in the UK for the past few days, so my workshop has been rather quiet, but I thought I’d share some pictures of the designs I was working on before I left. The darker evenings and clear, cold autumn skies have prompted me to work on some pieces inspired by the moon. 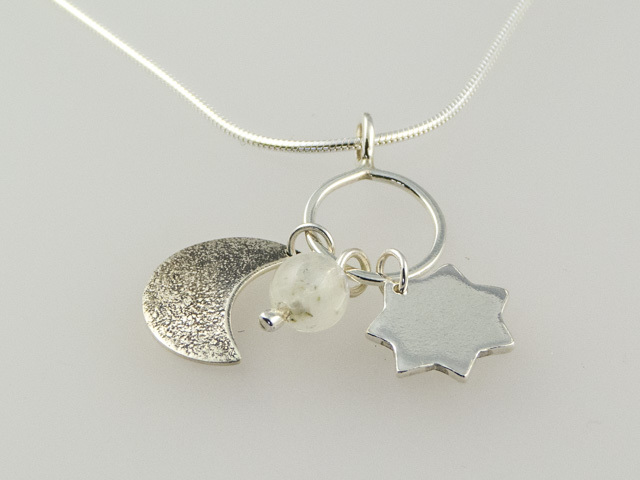 The first is this celestial necklace, which features three little charms – a crescent moon, a silver star, and a moonstone bead. The second is still a work in progress – a crescent moon pendant. I’ve soldered the moon shape to a silver circle, but I still need to do a bit of oxidising, polishing and finishing. The moon is surrounded by mythology and symbolism. It is associated with women and femininity, with the mother goddess, and with the rhythms of time and nature. A waxing moon represents growth, whilst a waning moon symbolises quiet contemplation. The moon is also the ruler of the zodiac sign cancer. It offers lots of interesting possibilities in terms of design, so you may well be seeing more of it in my creations in the future. I have a range of lunar designs for sale in my online shop.